What do you think? 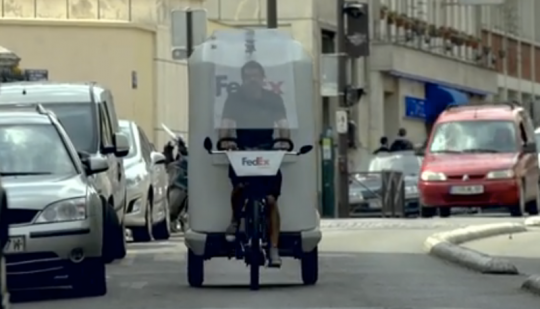 Could Fedex use an electric trike to make deliveries in your city or town? P.S. Don’t forget to get sign up for updates from the electric bike world, plus ebike riding and maintenance tips! whare can i buy this Electric Trike in this clip ? Does anyone know where one can source the trikes being used by Fed Ex? We are also creating an electric trike coming soon! Check it out! I love the concept, but the driver needs wayyyyyy better mirrors. I will do what I can to make electric vehicles happen in my town and my country so I am forever after information that will help make it happen. I have seen how electric trikes work in CHINA and I figure they can also be used in New Zealand. I will hook up with anyone in New Zealand to help make that happen. Electric TukTuks might be a better idea. Because of the scare tactics and lobbying of the European Bicycle Federation, ebikes in Europe are really weak and slow, and not practical for freight delivery. In their zeal to “protect” other cyclists from some imagined “safety concerns” ebikes are only 250 watts of power, only pedelecs, and the amount of power assist declines the faster you go. This was all done without benefit of any kind of scientific study, just propaganda from anti-ebike factions. Correction, that was the European Cyclist’s Federation. I’m surprised that ebikes are so restricted in Europe, although I have to say I have found 250 watts to be quite adequate for a pedalec myself. But if you think 250 watts is bad, ebikes are not even legal in New York City or New Jersey, two major urban areas that could really benefit from them. The environmentalists are not much help, either.